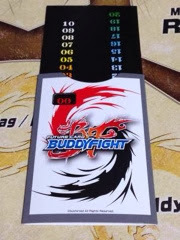 - Each player must have a 52 card deck consisting of 1 Buddy + 1 Flag + 50 cards (Up to 4 copies per card) and a Life counter. 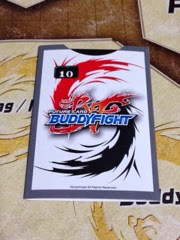 - Note that the Buddy monster is not part of the 4 copies in the deck. 1. Place your Flag face down. 2. Select a Buddy from you deck, and place it face down beside the Flag, and then shuffle the deck. deck into gauge (face down). 5. Both players will play a game of scissors paper stone to decide who go first. 6. Each player starts with 10 Life (Players with 0 Life loses). 7. Once everything is ready, both players will flip up the flag and shout [Open The Flag!] to start the game. 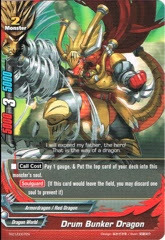 Power: The number used when calculating battle between monsters. Defend: The total amount a monster can take before it gets destroyed. Attack: The damage done to the player. 1) Stand all your monsters in rest. 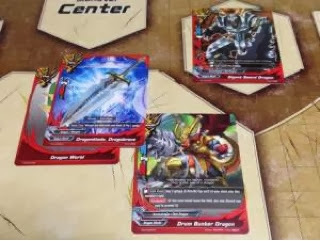 2) Draw 1 from the deck (First player do not draw during his or her first turn). 3) Send 1 card from your hand into the Gauge, and draw 1 from the deck (Not compulsory). 1) Call a monster from your hand. Note: Each player can only have a total of 3 points on each field. - Player may do a Buddy call once per game. - Player will first place the buddy from your hand in rest into the buddy zone and pay the Call cost (if required), and call the buddy into the field. - By doing a buddy call player will recover 1 Life Point. 3) Cast a Spell from your hand. 4) Equip an Item (player may replace existing item by equiping a new one). Note: Player can only equip 1 item at all time. 5) Using an [Activate] skill. 1) Select your attacking monster or Item and rest them. 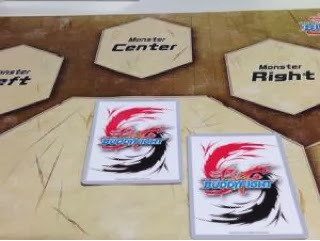 Note 1: Player may select 2 monsters (or item) and do a combo attack. By doing a combo attack the total Power of the 2 selected monsters (or item) will be combined. Note 2: Take note that Item cannot attack if there's a creature in your center. 2) Player will than select the target of the attack (Player or Monsters). 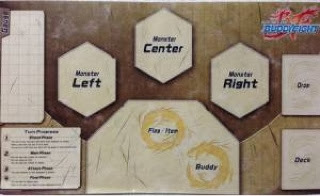 Players can only select another player as an target if his or her center is empty. In the case where the attack hits the player, the player's Life counter will decrease according to the attacking Attack. 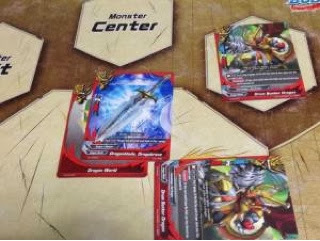 3) If an attack hits another monster and the attacking monster's Power is equal or greater than the defending Monster's Defend, the monster will be destroyed, and send to the Drop zone. 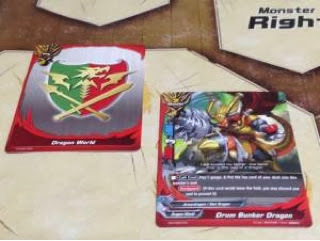 Special Note: First player can only attack once during his/her first turn. 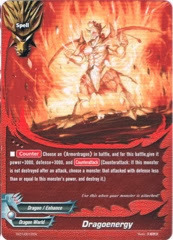 - Player may use Spell cards with [Counter] during your opponent's turn attack phase. - Defending player's Spell will have priority. - You can only play 1 counter card at a time. 5) If the player have any other Monster/Item in stand, Player may repeat Step 1 of the Attack Phase. 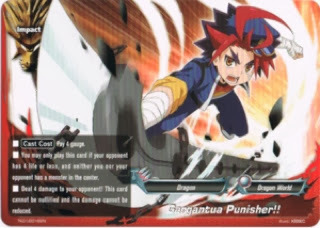 - Player may activate the Impact card during this phase. 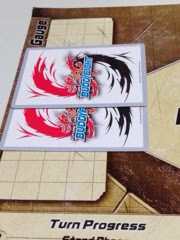 - In the case where a player do not use any Impact Card, the turn will end. Soul Guard: When a monster with Soul guard is destroyed, you can revive it by sending a soul into drop zone. 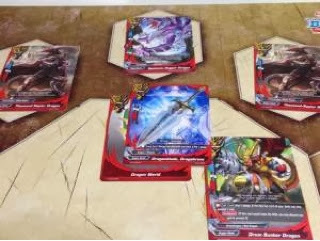 If an effect were to send your monster with Soul Guard back to hand or deck is used, you may send the soul into drop zone to protect it. 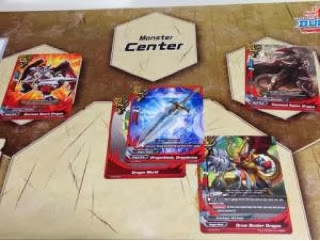 Penetrate: If a monster with Penetrate were to destroy a monster in the center area, damage will be dealt to the opponent player. 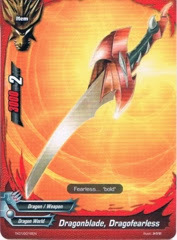 Double Attack: When a monster with this skill attacks for the first time it will be turn back to the [Stand] position. 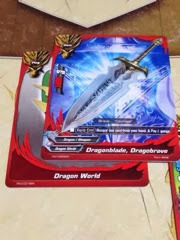 What if a deck deck out? - Currently Unknown. CMD will update when it's confirmed. Beginner Guide prepared by Freedomduo.